As my uncle heaved his pack up over a 6 foot high granite ledge to me, I realized the reason for his weariness. This ancient wicker behemoth with who-knows-what filling its cavernous depths must have weighed a ton! The two shoulder straps were padded only by thin, decaying leather-there was no hip strap, no pockets, frame or high tech air-cooling trampoline. It was a relic of a simpler age of backpacking. This ancient piece of equipment once belonged to my grandfather, a veteran of World War II. He was a foot soldier in that war-trudging through the mud and blood of the battlefields of France. There he carried an 80 pound machine gun in addition to his own gear, so he was no stranger to heavy loads. 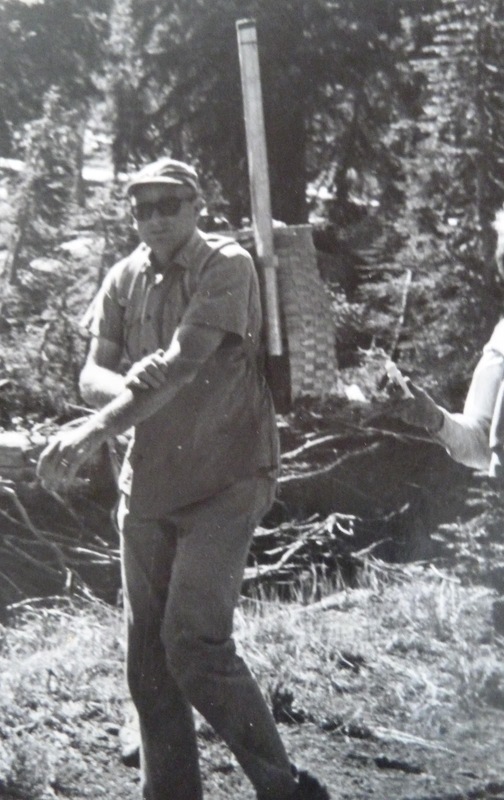 After the war, Grandad became a fire lookout in Idaho. Being a lookout in those days was not a job for day-dreaming poets. When he spotted a fire, Grandad would set out cross country with a Pulaski, radio, and rations, among other equipment, all of which weighed over 70 pounds, to fight the fire himself. When his lookout days were over, he took up backpacking with his family. Their gear was army surplus, and Grandad carried almost everything in that wicker pack that my uncle still carries- two 20 pound down sleeping bags and cast iron cookware (my mother and her sisters carried only small rucksacks with their own cotton sleeping bags), but after carrying machine guns during the war and firefighting gear on the lookout, Grandad wouldn’t have complained about the weight. 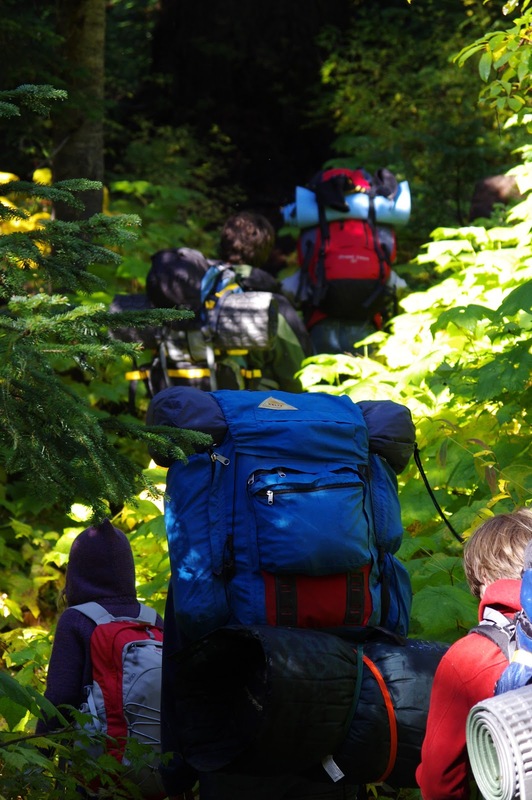 Backpacking then was not a hobby embarked upon by thousands as it is today; in that day the forests and mountains were empty of the multitudes of the modern era. Nowhere was a permit needed, and if there was a single other living soul at a lake (and lakes were always the destination - why hike where there were no fish? ), then it was considered to be too crowded. Everyone slept on beds of tree boughs, and if rain threatened, a tarp was strung between the trees. With the advent of the backpacking craze in the 70s, and the subsequent flooding of the wilderness with adventure seekers, came advancements in backpacking gear. My grandmother took a class in backpacking. My grandparents bought build-it-yourself Frostline packs and assembled them for the whole family, and filled them with the new rage: freeze dried food. Each trip was carefully planned; all the gear was laid out and sorted before departure. For these trips, Grandad would travel “light” with the new backpacks, but for weekly day hikes, it was always back to the wicker basket. Into the basket would go fishing gear, lunches, books, and sweatshirts for a family of seven. It was no surprise that Grandad, with his long distance, never wearying, rhythmic hiking style, would find his children rejuvenated and ready to go when he caught up at the designated resting stops. The trusty wicker pack was eventually passed on to my traditionalist uncle, who still uses it in exactly the same way as Grandad did. 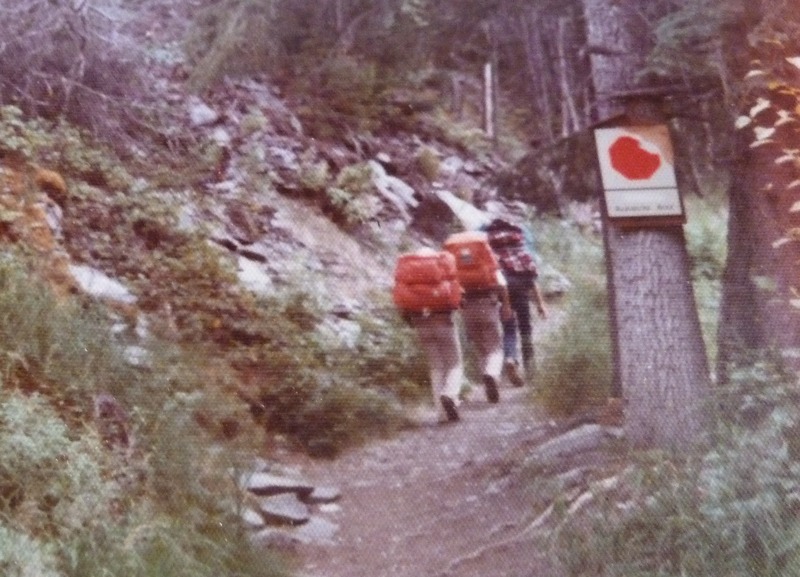 In my own family, backpacking trips were dominated by external frame backpacks (which my mother still uses). My parents would fill up the main bag, and then tents, sleeping bags, and extra clothing was all strapped to the outside, since we, too, had a large family and always had more gear than we needed. We must have looked like hobos traipsing down the trails with all manner of plastic bags strung haphazardly to the back of our packs and a string of grubby, but happy, little campers straggling behind with their tiny day packs. It was not until the 90‘s that the family was introduced to internal frames. My father’s first “internal frame” backpack was a top of the line, quality pack from “Outbound”. The “frame” consisted of two long metal staves that were pushed up through slots in the back of the pack. The traditional method of loading this packs was to stuff it with supplies until it could hold no more, so that it would stay rigid by virtue of all the gear packed inside. It was not the most comfortable of packs, but it was sturdy. More than a decade later I was still using this same pack, now old and decrepit and emanating disturbing smells, to ferry my trombone to band and back every day, riding a bike of similarly ancient origin. Finding a way to balance the pack with the trombone inside was no small challenge. It must have appeared to passersby that I was being savaged by a gigantic green slug. The numerous free-range dogs that EVERYONE on our road owned would come rushing out snarling, possibly in an attempt to save me from the giant slug. After years of slugging it out with the decrepit remains of a bygone era, we finally began to move into what we thought of as “ultralight backpacking”. These modern packs tested the limit of what mere metal and fabric could achieve. These new packs were supported by aluminum filaments meshed seamlessly with space age fabrics. There was a cool mesh “trampoline” behind our backs, and the shoulder straps and waist belt were thickly padded. The kids were kitted out with their own fancy internal frame packs- just $30 from the local outdoors store! What a steal! Our high-tech gear did not end with the packs; tiny propane stoves replaced hulking white-gas canisters. Our vast, cave-like shelters were now replaced with tents that weighed under ten pounds! Our heavy cotton bags were replaced by slightly lighter nylon and polyester filled sleeping bags. As we hit the trails with our new gear, we thought we should be able to hike miles farther, and we felt ourselves to be up to par with every modern backpacker. As we hiked, we marveled at the strange lightness of our packs. We no longer had to pad the shoulder straps with sweatshirts to make them bearable, and we were not hampered by the constant sway and thump of the various articles we usually tied to the external frame and were now packed neatly inside. We knew we were still not quick, since my mother has a tendency to pack for every contingency. What we had not anticipated was that we were being outdistanced by what we first assumed were day hikers. So small were their packs that we figured they must have room for little more than a sandwich and a cell phone! Much to our dismay, we realized that these swift creatures with the tiny packs are the true modern day backpackers. Their sleeping bags pack into miniscule stuff sacks, their sleeping pads are cut into tiny pieces to minimize their size, and many have done away with tents all together and have returned to the light weight, all -purpose tarp for shelter. There is little chance my family will enter this new age of hiking, where gear is minimalized and hiking speed is maximized. For one thing, the extremely lightweight gear is too pricey, and for another, we are creatures of comfort, who love to loll about at a mountain lake, fishing, exploring, or just enjoying the scenery. 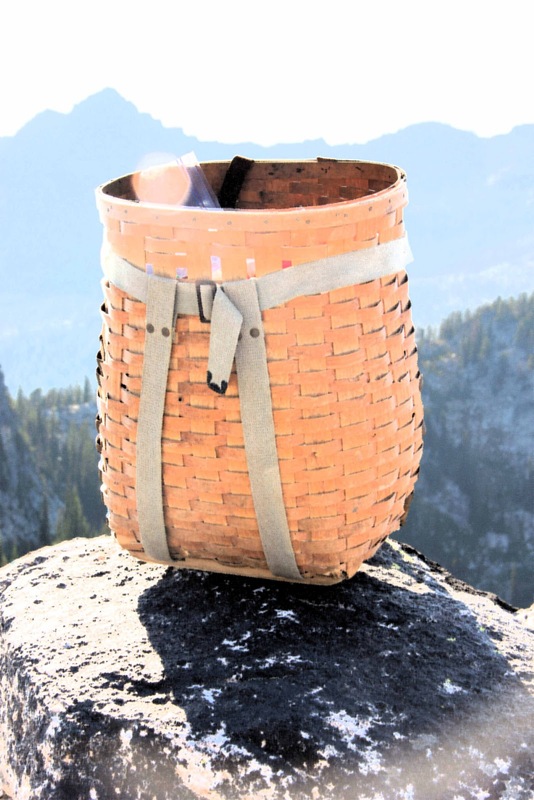 While the hiking community continues to race ahead, we slow down and revert to a bygone era, when a wicker pack filled to the brim determined the pace, and let us have plenty of time to bask in the beauty and solitude of the wilderness. I loved this! Your writing is so easy to read, and you have me smiling and chuckling out loud all the way through. Please keep writing! Thanks for reading! I really appreciate the positive feedback, and I will definitely keep writing!